With the all new LEF-20 UV Flatbed Printer, you can print directly on virtually any substrate or dimensional object up to 20" x 13" x 3.94." 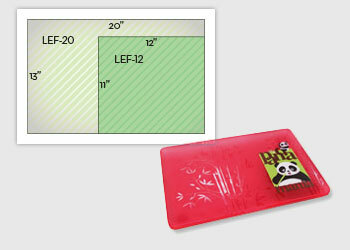 The LEF-12 offers a print area of 12" x 11" x 3.94." - LEF-20 features new, more advanced UV-LED curing system to expedite production. Clear and CMYK print 2x faster than the LEF-12. - Patent-pending automatic ink circulation system minimizes ink waste. The larger LEF-20 builds on Roland’s advanced UV-LED direct printing technology with a host of features that make it the most advanced and versatile printer in its class. n addition to a faster UV-LED curing system, the LEF-20 features a distance print mode for outstanding print quality on curved objects. Up to 20 job presets are included as well, allowing you to recall specific media settings instantly for your most popular applications. e it the most advanced and versatile printer in its class. New height sensor bar made with non-magnetic material allows printing on magnetic items such as iPad covers. The LEF-20 includes new, advanced UV-LED curing system to expedite production with two timesfaster clear ink and CMYK ink printing. Every VersaUV LEF Benchtop UV Flatbed Printer features Roland's advanced UV LED curing system, which offers many advantages over conventional UV lamps. the LED lamp on the VersaUV series lasts up to 10,000 hours, ten times longer than conventional UV lamps. while conventional UV lamps can reach temperatures as high as 1500°F (800°C), LED lamps are extremely energy-efficient and generate very little heat. This virtually eliminates all risks associated with high heat, such as damage to the substrates and head crashes caused by media deformation. LED lamps can be turned on and off instantly and are ready to use immediately after the printer is turned on. Conventional curing systems may take several minutes to reach the nominal output level and require shutter systems to protect the substrate and the head’s capping system from exposure to heat and UV radiation. Allows choice of finishes in matte or gloss. LEF printers come configured with CMYK, white and clear ECO-UV inks. ECO-UV ink was specially formulated for the VersaUV family of printers and printer/cutters to deliver high color density and wide gamut for applications ranging from promotional and industrial products, giftware and awards to signage, packaging, POP and small displays. Clear ECO-UV ink produces matte or gloss finishes and improves scratch and chemical resistance for extended durability – up to two years outdoors. Layers of clear ink can also be applied to create 3D textures and embossed effects. * Room ventilation and a Roland approved air filtration system are required. Please consult the MSDS for more guidance on the proper use and ventilation of ECO-UV inks. The VersaUV LEF-20 has a maximum print area of 20” x 13” x 3.94,” and the LEF-12 prints on objects up to 12” x 11” x 3.94” in size. The ingenious combination of advanced ECO-UV inks with the LEF’s low heat state-of-the-art UV LED lamps enables printing on a wide range of treated and untreated substrates, including PVC, PET, ABS, wood, boards, acrylic and much more. You can even print directly on metallic electronic devices or heat sensitive plastics without the risk of damage. It is a well-known fact that white ink contains heavy pigments that can settle over time, decreasing ink density and impacting the performance of the nozzles if not purged from the system periodically. Roland’s innovative patent-pending system circulates the white ink to prevent pigments from settling in the lines. In addition, the system controls the discharge of white ink by monitoring its usage. Roland Intelligent Pass Control technology, developed by Roland software engineers, represents the pinnacle of inkjet printing. This patent-pending system precisely controls dot placement between passes and delivers unprecedented imaging performance in all resolutions. Roland Intelligent Pass Control enables the VersaUV LEF to produce exceptionally smooth gradations and solid colors with virtually no banding in all print modes. This method uses the lower right and upper left corner of the object as reference points to generate a bounding box that can be read by Roland’s VersaWorks®. Typically used for circular, curved or odd shaped items, this method uses the center point of the object as a reference point and requires the user to enter the dimensions of the printable area. To ensure outstanding print quality around the curvatures of objects, mist filters are incorporated in the LEF, catching most residual ink that may mist when printing off the edge or curvature of a product. This cuts down on overspray and keeps the ink from settling on the printer’s internal components. Filters are designed to be easily replaceable by the end user. 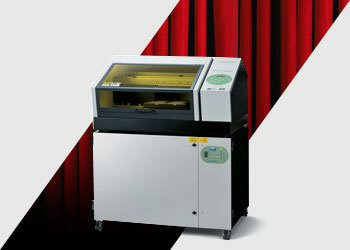 The VersaUV LEF is the only benchtop UV printer that is fully enclosed. Having a fully enclosed system cuts the risk of UV light exposure to the skin and eyes, reduces dust and debris, and minimizes ink odor. The energy-efficient VersaUV series uses only a fraction of the power used by a conventional UV printer and automatically enters a low-power mode when it is not used for an extended period of time. This energy-efficient design literally saves thousands of dollars in electric bills each year and reduces considerably the emission of greenhouse gases. And because LED lamps do not require any warm up time, they save both time and energy. Traditional UV curing equipment can expose operators to harmful ozone and UV-B and UV-C radiation. Ozone is a known air pollutant that can cause lung damage and respiratory problems. UV-B and UV-C radiation can cause eye damage, skin cancer and accelerated skin aging. The LED lamps on the VersaUV LEF are completely ozone-free and only emit the much safer UV-A radiation. VersaWorks RIP software has been exclusively developed for Roland inkjet printers and printer/cutters. This true Adobe® PostScript 3 RIP ensures exceptional production output with unmatched ease of use. VersaWorks features the Roland Color System and PANTONE® libraries for spot color matching, Variable Data Printing for customized job output, ink consumption and print time estimation, and the Max Impact preset for richer color contrast, outstanding image quality and maximum productivity. VersaWorks also includes the Roland Texture Library featuring 72 ready-to-use textures that can be applied to designs by layering ECO-UV clear ink. For precise color management, Roland now offers X-Rite's i1Basic Pro 2 for calibrating your monitor to display accurate digital color as well as, linearizing your Roland printer for consistent output. Upgrade to the X-Rite i1Publish Pro 2, which includes the same capabilities, as well as complete ICC/ICM media profiling. Both packages include the new i1 Pro 2 spectrophotometer, PANTONE® Color Manager software and an accessories package. The i1Publish Pro 2 also includes i1Profiler software. Roland OnSupport is an online support portal that provides real-time feedback on the user’s machine. This system monitors ink levels and provides access to manuals and software updates, how-to guides, preventive maintenance guides, machine usage metrics and periodic updates to firmware. It sends notifications to the user’s cell phone or email address and allows the user to both manage productivity and gain direct feedback from Roland. Roland inkjets combine unbeatable performance with legendary Roland reliability.